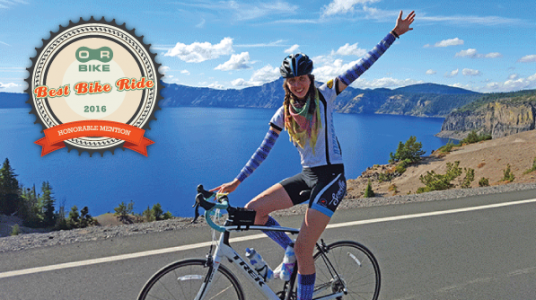 Ride the Rim is a spectacular opportunity to ride Crater Lake the best way possible – without cars! This gorgeous natural wonder is absolutely stunning, and riding the rim without the chaos of cars is a very special experience. Oh, but you won’t be alone! Named the 9th Best Bike Ride in Oregon in the ORbike Riders’ Poll, this is certainly a favorite ride among many people. The two car-free days attract huge crowds of friendly cyclists at the free event,. RIDE TIMES: 8am to 6pm, East Rim Drive will be closed to all vehicular traffic. The East Rim can take roughly four hours to complete, give or take a hour based on individual experience levels. Please plan accordingly. RIDE PROFILE: Approximately 25 miles with 3,500 feet of elevation gain. NOTE: There is no support vehicle on this free ride. NEW THIS YEAR: The organizers have planned after party and reservable dinner back in Klamath Falls with live music. It’s where everyone gathers after the ride! BIKE VALET: Ride the Rim offers a free bike valet at the North Junction and Park HQ while you fetch your car in the opposite parking lot using the FREE Shuttle Service.